I love using wholefoods and healthy foods but it can be hard to find them in regular supermarkets. When I was contacted by family run & independent wholefoods company called Buy Wholefoods Online I thought it was a fantastic way to get healthy foods delivered directly to your door. I received some really great products which I have been told are some of the most popular available, each with their own benefits. When I saw the Maca Powder, I wasn't quite sure what to do with it so had a look online. 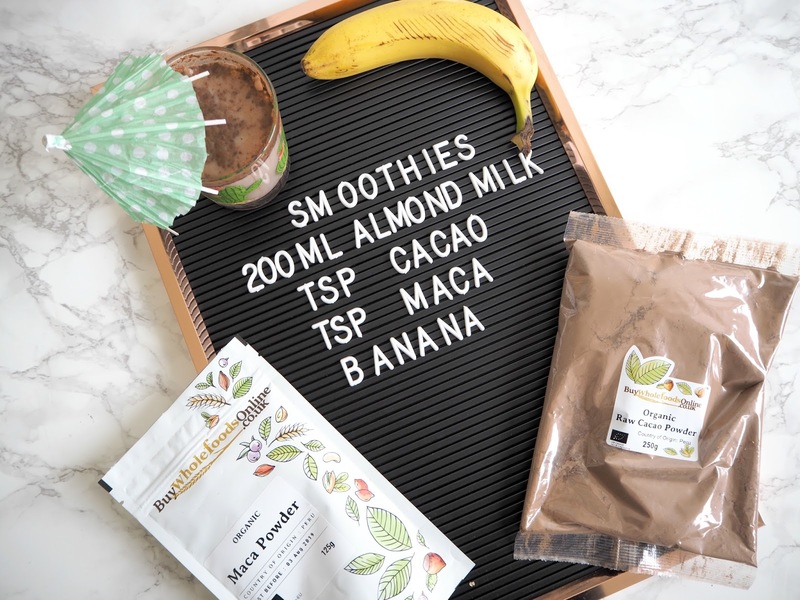 It has been tipped as the top superfood for 2018 and can be added to smoothies, porridge, granola, shakes and baking. It's such a versatile product and the recommended dose is 1-2 teaspoons a day. It's rich in antioxidants and can boost male fertility. It's excellent value on Buy Wholefoods Online compared to other leading brands. Alongside the Maca, I received Raw Cacao Powder. This is something I have used before and is becoming increasingly popular. It has an intense deep chocolate flavour, similar to cocoa powder however it has not gone through the same process so retains all of its goodness and flavour. Again this can be added to porridge, smoothies and whatever takes your fancy. I like using it for raw energy bars. Raw Honey is something that has been growing in popularity and I see it more and more popping up in shops and in healthy recipes. Raw honey can be hard to find but is said to have a much better taste than normal honey which I completely agree with. 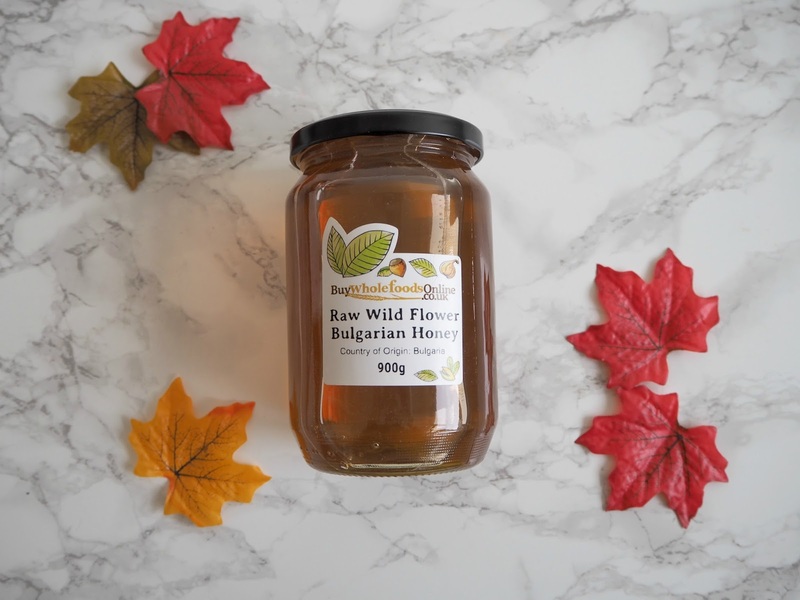 Raw honey is unfiltered and unpasturised which enables it to keep all of the great health benefits that honey is meant to have. It can also help to counter pollen allergies so I am going to let my fiancé have some of this to see if it helps with his hayfever this year. Another interesting fact is that honey is said to be a natural antibacterial with wound healing effects and has been used to treat burns and wounds! Who'd have thought it. 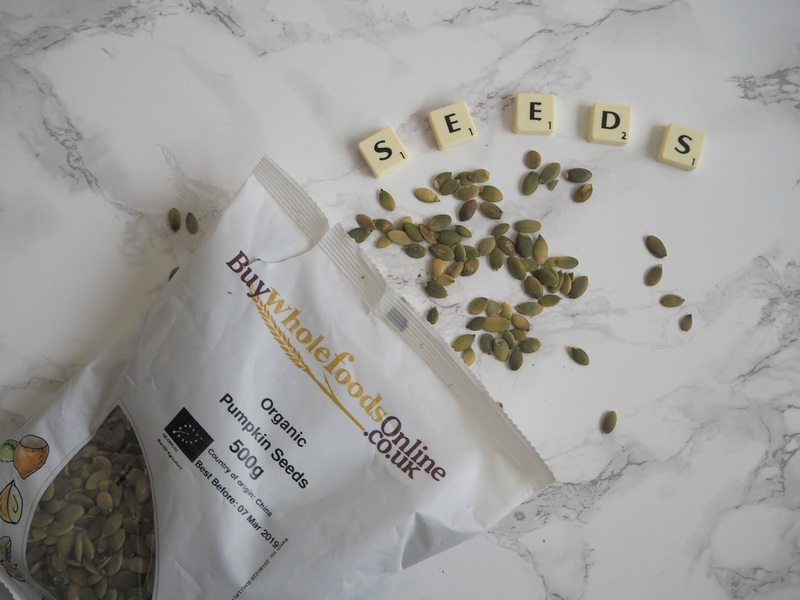 I love pumpkin seeds and was very happy to see a whole 500g bag of them! They're ideal as a snack as they are rich in protein and full of healthy fats. I like them on top of some nut butter on toast. You can use them in homemade granola and cereal bar recipes too as well as in salads which can add some texture. They are loaded with health benefits and are also said to improve sleep! I can't wait to make a start on these. Last but not least I received some Spirulina Tablets. 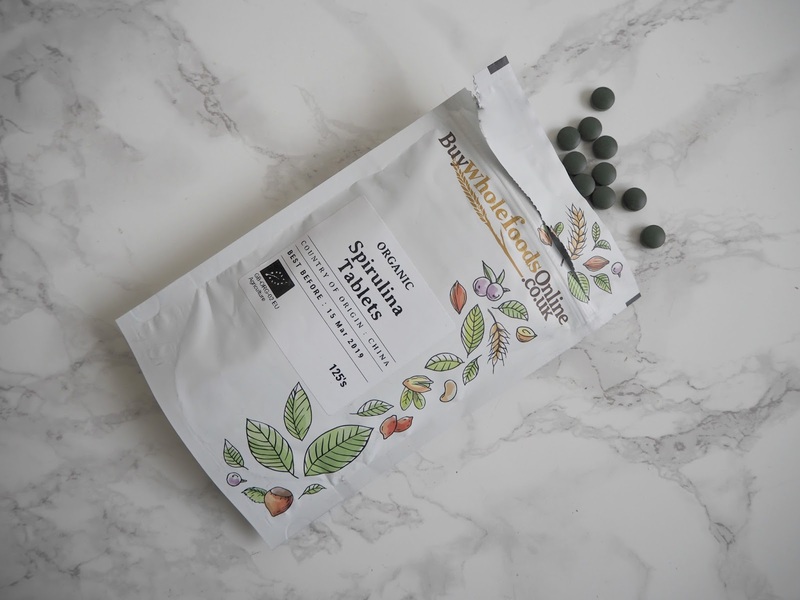 I have previously tried the powdered version of this and didn't really like the taste as it has a slight algae flavour so I was pleased that I was sent the tablet form as it's a lot easier to swallow. This has been a famous super-food for a while now and is something that can be taken daily. It has so many benefits including speeding up weight loss. I will let you know how I get on with these. Overall, I am really happy with my bundle of wholefoods and can't wait to incorporate these into my diet and lifestyle. 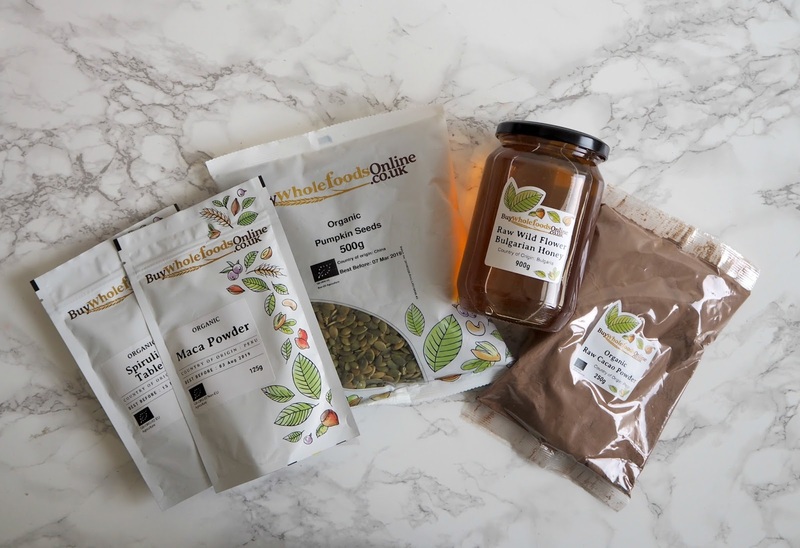 To purchase these items yourself and many more amazing foods, head to Buy Wholefoods Online. *I received these products free of charge in exchange for an honest review. All opinions are my own and I was not influenced in any way.